For additional details contact Terry Bolinger at 303-627-1855 or e-mail at Tbolin3194@aol.com. Come to Grant's Pass in 1999! The 1999 Annual Convention of the Zane Grey West Society will be held in Grant's Pass, Oregon, from June 14 - June 17, 1999. 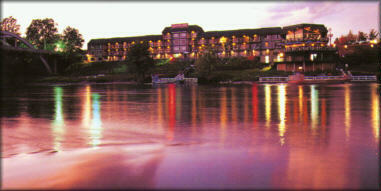 The convention headquarters will be the Riverside Inn. Registration information will be available in early January, 1999. Next year the Zanies are off to the Pacific Northwest to visit ground that our group has not yet trodden, the Rogue River country of Southern Oregon. This will be our chance to meet our members who haven't had a chance to come to a convention. We will be travelling down the Rogue on our Wednesday trip, into the Hellgate wilderness, leaving from the docks in front of our motel, the Riverside. Most of the rooms at the Riverside have riverfront views and the rates are confirmed at $69 per night. If you have access to the ZGWS Website, you can get more info on the Riverside. The sites and towns that you might want to visit are countless. Southern Oregon & Northern California include places like the Oregon Caves, Lava Beds National Monument, and Modoc Stronghold where a handful of Modoc Indians held off thousands of US Cavalry soldiers. Lost River is there, which ZG called "Forlorn River". This is the area of "Rustlers of Salmon River", better know in book form as "Rogue River Feud". ZG has several chapters in "Tales of Fresh Water Fishing" devoted to Oregon. Not far to the North of Grants Pass is Roseburg, which is on the North Umpqua River where ZG did his final fishing. You can start reading now to get into the mood for the trip. In the months to come we will be giving you more history on this area and also details about the convention as they develop. We will be looking to our Oregon members for any help that they can give on convention details. I asked the group at the Colorado Convention about interest in going to Crater Lake after the convention & I saw about 20 hands. We will try to reserve rooms at the lodge at the Lake for Friday night. I will get more details on this, but if you have never seen this Wonder you will want to, even if you don't spend the night at the Lake. It is an old volcano, whose cone has filled with water from winter snow runoff. ZG fished there. It is breathtaking! The week that we will be in Grants Pass is 6/14/99 (Monday) and I am sure that on your way there you will pass a couple of bookstores to locate items for the Auction. This last auction in Colorado was our biggest ever, so we will have to come up with some great items to top it next year. Remember this will be the last ZGWS Convention of the 1900's so lets make it a great one! On Friday, 6/18/98, after the Convention many of our group will be heading for Crater Lake National Park, about 2 hours from Grants Pass, Oregon. We plan to stay there for one night and do as much site seeing and visiting as possible. Last convention, about thirty of us were able to gather for two days at Trapper�fs Lake and we had a wonderful time. With no agenda we were able to see many beautiful sites while getting some quality time to visit with each other. There are a few different ways that you can stay at the lake. It is a place that everyone needs to see, beyond description, (at least by me). Let�fs let Zane Grey try: " I expected something remarkable, but was not prepared for a scene of such wonder and beauty�c. It seemed a blue gulf�cNowhere else had I ever seen such a shade of blue�c. How exquisite, rare, unreal!" He wrote these words in 1919 about his first siting of the lake. While there he of course found time to fish and was successful in catching some rainbow trout. You can read about this starting on page 81 of Tales of Freshwater Fishing (Derrydale). The chapter is titled, "Crater Lake". Originally there were no fish in the lake. They were introduced between 1888 and 1941. Crater Lake stated as Mount Mazama, which some scientist felt, reached a height of 12,000 feet. About 7700 years ago the mountain erupted violently shortening its height down to the 7100 feet that we now see. The crater of the volcano slowly filled with water from the melting snows each year to form the lake that we can now enjoy. Its depth reaches to nearly 2000 feet in places. The winters are long but June should be a pretty month for our visit. Zane Grey felt that the Rogue River started from fissures at the base of the mountain that released water from the lake. Wildlife is abundant in the area; deer, elk, black bear and the Golden Mantle squirrels that constantly entertain you. There is a museum and a rim drive that you can take leading around the lake that is 33 miles. The Crater Lake Lodge on the rim of the lake is the place we would like to meet. It is a very historic lodge that has been recently renovated. The price per night is up to $135 now and will go up a few dollars by next summer. There are some rooms on the waterside and the rest will be on the valley side of the Lodge. This will be first come, first served, so get on the phone as soon as you finish reading. If you are looking for more economical accommodations there is the Mazama Village Motor Inn seven miles from the Lake. It runs about $83 per night. For you campers they have the Mazama Village Campground at $11 per night. So you can see they have something for everyone, but the space is limited so don�ft delay. The number to call for reservations is 541-830-8700. Be sure to read your copy of Tales of Freshwater Fishing as it has much info on the areas we will be visiting. ZG really loved this country and it�fs fantastic that we will be able to visit many of the same sites that he fished and explored. Loren and Bonnie Grey have told me that Oregon is one of their favorite vacation spots! I�fm sure that Loren can give us more back ground on ZG�fs visits to Crater Lake. We have many ZGWS members in that area that have never been able to attend a convention and I have heard from several of them saying they will be there! So, we will also get to meet some new friends, which is one of the great reasons for attending the conventions. Oregon or Bust! The agenda and other details will be available by January 1999. For more information on the Riverside Inn, access www.riverside-inn.